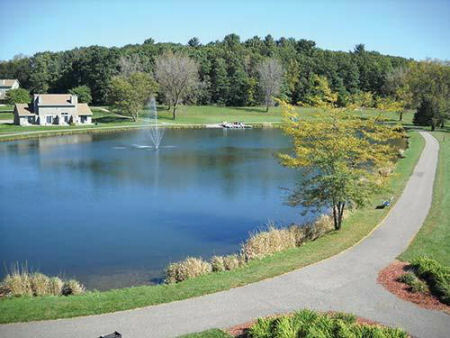 Mirror Lake - Tamarack in Wisconsin Dells, Wisconsin - Bid on a 7 Night Stay in a 1 or 2 Bedroom Suite! Enjoy 7 nights in a 1 or 2 Bedroom Suite at Mirror Lake - Tamarack in Wisconsin Dells, Wisconsin! Located midway between Chicago and Minneapolis, Wisconsin Dells is an ideal family vacation spot with many different and entertaining activities offered year-round. In the late Fall and Winter, you can ski and ice skate. In the Spring and Summer, take the kids to ride the "Ducks," on a scenic tour, or to one of the thrilling water parks. Whether you're bringing the kids, or your're just a kid at heart, the Dells will keep you coming back for more enjoyable vacation experiences. Your 1 BEDROOM SUITE will sleep up to 4 guests and has a full kitchen. 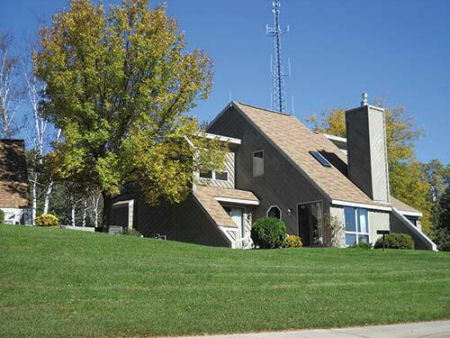 Central air conditioning, patio furniture, iron and board, vacuum cleaner, and much more are yours during your stay! A whirlpool bathtub/ shower are featured in the suite's only bathroom located off of the living room. A queen size bed is located in the bedroom and a Queen sleeper sofa in the living room accommadate for sleeping arrangements. A full sized kitchen equipped with a coffee maker, dishwasher, full size oven/stove, cooking utensils, microwave oven, pots/pans, dishes, kitchen sink, cutlery, and refrigerator are all a part of the kitchen! Check-In Dates Available for 7 Nights in a 1 Bedroom Suite! 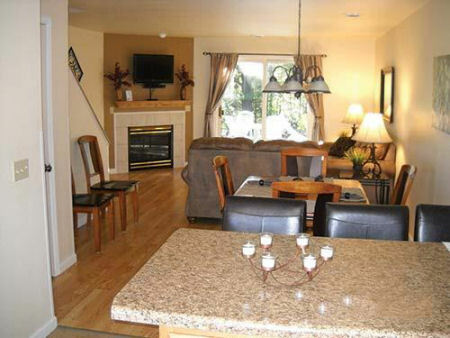 Upgrade to a 2 Bedroom Suite for $75 for the Week! Your 2 BEDROOM SUITE will sleep up to 6 guests and has a full kitchen. Central air conditioning, patio furniture, fireplace, iron and board, vacuum cleaner, and much more are yours during your stay! A whirlpool bathtub/ shower are featured in the suite's only bathroom located off of the living room. 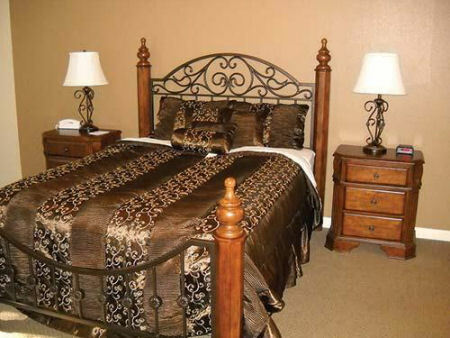 A queen size bed is located in one bedroom and two single beds in the other. A Queen sleeper sofa in the living room also allow for sleeping arrangements. A full sized kitchen equipped with a coffee maker, dishwasher, full size oven/stove, cooking utensils, microwave oven, pots/pans, dishes, kitchen sink, cutlery, and refrigerator are all a part of the kitchen! Check-In Dates Available for 7 Nights in a 2 Bedroom Suite!